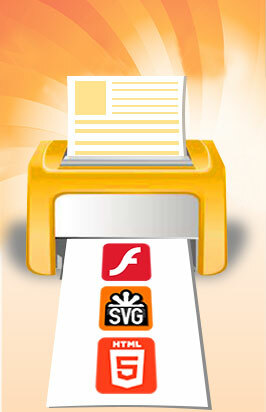 When a document is converted, or "printed", with Print2Flash, Print2Flash Printing Application is launched. At first, this application shows you conversion progress. Then, it displays you the converted document for preview. And finally, you may save the converted document to disk. To open Print2Flash Printing Application, start printing a document to the Print2Flash Printer or choose "Print2Flash Printing Application" from the "All Programs/Print2Flash 3" submenu of Windows start menu. Convert - converts any printable document to Print2Flash format. You will be prompted for the location of the document you want to convert. After conversion the converted document is shown in the converted document area and then you can save it using various Save... buttons (see below). Save - saves both Flash and HTML5 versions of the document altogether will all files necessary to open the document. It will create a HTML preview file and a related folder with the document (named after the file name but ending with _files). See How to Publish a Print2Flash Document on the Web? topic for more information. In "External viewer" format you will be prompted for the filename and location of document file(s) before saving. In the Save As Type field you may choose whether you want to save only the Flash document file (Flash Document option) or the document altogether with the viewer and HTML preview page (Flash Document with HTML Preview Page option). In the latter case it will create a HTML preview file and a related folder with the document (named after the file name but ending with _files). Save HTML - saves only the HMTL5 version of the document. You will be prompted for the file name and location of the HTML document file. In the Save As Type field you may choose whether you want to save only the HTML document without the viewer (HTML Document option) or altogether with the viewer and preview page (HTML Document with Preview Page option). It will create a file and a related folder with document resources (named after the file name but ending with _files). Save All - saves all data generated at the last document conversion: Flash and/or HTML5 document, metadata file and page thumbnails. You will be shown the Save All window where you can choose a location to save the data to and other saving options. Help - shows this help system. Here you may preview the converted Flash document before saving it to disk. This tab is shown only if you requested Flash document conversion with Create Flash Document option in the Flash Output Tab of Document Options window. While previewing you may perform any operations allowed in document interface: scrolling, enlarging, rotating the document, etc. See Converted Document Interface for more information. Here you may preview the converted HTML5 document before saving it to disk. This tab is shown only if you requested HTML5 document conversion with Create HTML5 Document option in the HTML5 Output Tab of Document Options window. While previewing you may perform any operations allowed in document interface: scrolling, enlarging, rotating the document, etc. See Converted Document Interface for more information. If you requested creation of metadata file using Metadata tab of Document Options Window, it is displayed in this tab. If you requested creation of page thumbnail files using Thumbnails tab of Document Options Window, they are shown in the Thumbnails tab. Thumbnail images are scaled when shown in this preview. To view a thumbnail in its true dimensions, just click the image in the list.